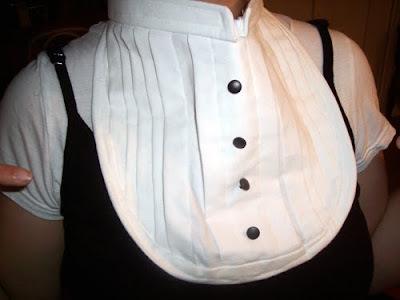 My Tuxedo Bib | Oh Sarah O ! For New Years 2010 I made myself a tuxedo bib (as seen on Threadbanger and BurdaStyle) but I never posted any pictures...until now. It's a little stiff around the collar and it needs a bit of styling prep to hang right, but it's still pretty cute and can dress up any outfit. If you're interested in making one of you're own, check out the tutorials at BurdaStyle or at Threadbanger. What I'm Listening To: Snoop Dogg "Oh Sookie"
What I'm Listening To: Kate Nash "Kiss That Grl"